On June 21, 1900, the Empress Dowager Cixi declared war on a Western-led alliance, taking the Boxer Rebellion to its height. The rebellion was crushed a year later. So-called "Boxers," like this man, violently opposed what they interpreted as unfair Western influence on Chinese government, economy, and religion. 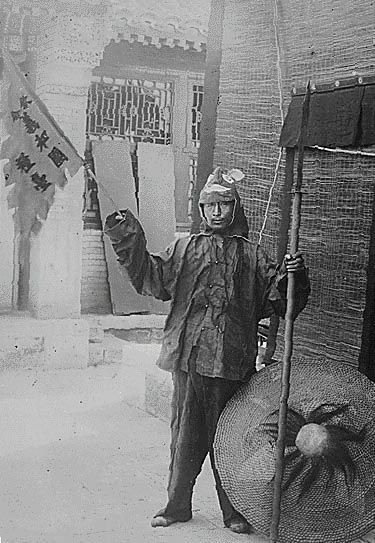 This image was taken at the height of the Boxer Rebellion in 1900. On June 21, 1900, China’s Empress Dowager Cixi declared war on the Eight Nation Alliance—the United Kingdom, Russia, Japan, United States, Germany, Italy, France, and Austria-Hungary. The declaration was the height of the Boxer Rebellion, a violent anti-Western movement that was crushed a year later. Members of the Militia United in Righteousness (Yihetuan) were nicknamed “Boxers” by Westerners because of their practice of martial arts and vigorous calisthenics. The Boxer movement resented what it interpreted as a growing and unfair Western and Japanese influence in China—the expansion of Western businesses, the outreach of Christian missionaries, and the privileged treatment of Western residents. The Boxers and their supporters attacked and burned businesses and churches, and assaulted and killed individuals. Christian missionaries were especially targeted. The Boxers were ultimately defeated. Troops from the Eight Nation Alliance stormed the Forbidden City, took control of the Chinese capital of Beijing, forced the imperial court (including the empress) to flee, and imposed a treaty that devastated the Chinese economy. The failure of the Boxer Rebellion led to a leadership crisis in China. This, in turn, contributed to the Xinhai Revolution of 1911, in which a republican government replaced the 2,000 year-old Chinese empire. (1898-1901) anti-Western, anti-Christian movement in China. repetitive exercises (such as sit-ups or jumping jacks) performed to promote physical fitness, usually conducted without special equipment. monarch or other noble person and the group of people who serve, advise, and consult with them, or the place where this group meets. to state clearly, in formal terms. widow who has inherited property or titles from her husband. condition of being resistant to disease or liability. having to do with an empire. to force or set out rules to be followed. forms of self-defense and combat that do not usually use weapons. group of armed, ordinary citizens who are called up for emergencies and are not full-time soldiers. to reject or dismiss due to a sense of injury or insult.